Finally.... our lilacs are beginning to bloom - and such a fragrance they share! Heavenly! Like many, we've had an extremely early and WARM spring - so the lilacs started to bud early. We then had a flash frost - and 6 out of 7 of our lilac bushes were affected.....thusly produced very little flowers, if any, and tiny ones at that. I was SO UPSET! But this bush was transplanted out of our main garden because it was getting too big. So we moved it among the trees lining the back of our property. It must have been protected by the trees enough to keep the frost at bay......thus thanking us with an abundance of wonderful blossoms! I have been cutting and giving bouquets away for a few days now! Here is the bouquet I kept for myself, in a new-to-me favored antique English pink Ironstone pitcher. I had never seen pink Ironstone before this find! There below is one of my very favorite thrifty finds - an old heavy solid wicker and metal table that I scored at GW! And works well in this shady corner patio area. I love it because it isn't rickety at all, is quite heavy and stays very firmly planted and doesn't spill my tea if bumped! I move all my little tables too much a lot back here. 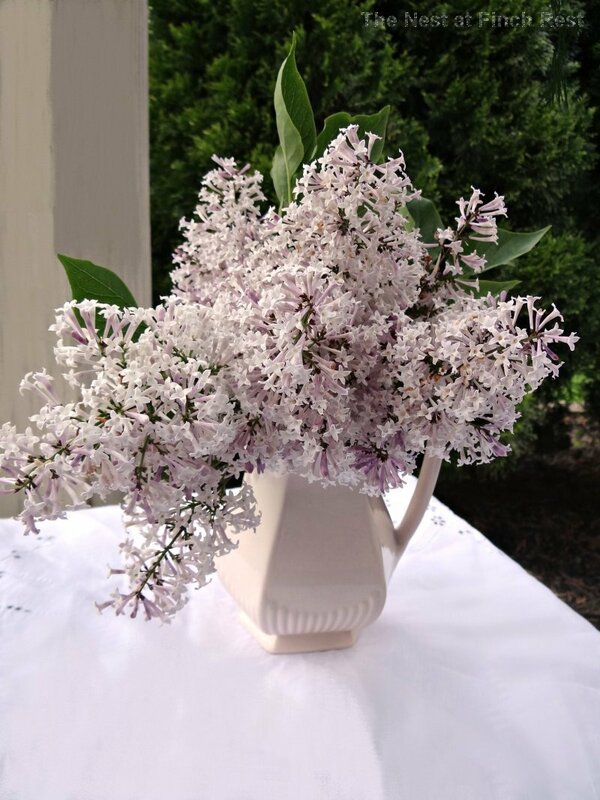 Your lilacs are beautiful in the pink pitcher. Great table you found as well. Gorgeous, Michele! They look great in your new pitcher, too! It must smell heavenly at your house. I LOVE lilacs! I wish they lasted longer. Your white table and chairs is adorable too. I just lilacs! 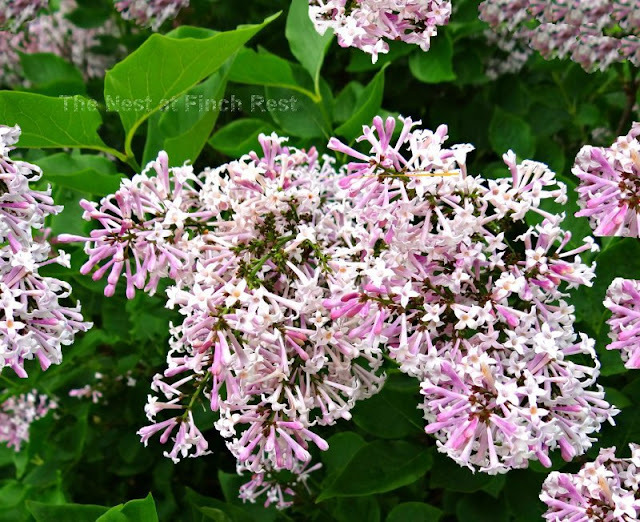 Why in the world don't I have a lilac bush??? Pretty, pretty! Pink abd lavender sre so luscious together. This is just a sweet little corner. You must love it here! Oh Michele, your lilacs are beautiful in the ironstone. 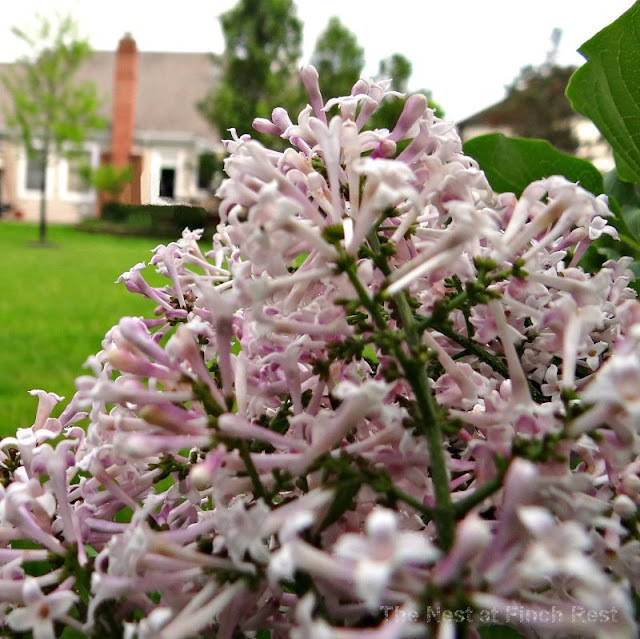 Look at it positively, you had one beautiful lilac bush this Spring and your blooms are truly gorgeous. I so enjoyed my lilacs this year (I only have three bushes) and did do a tablescape with them but next year plan to do an outdoor scape with them. The scent was too much for my allergies and I had to move them out to the deck quickly. Thank you for being such a sweet follower, you always leave kind comments and I do appreciate it. How gorgeous Michele...I love lilacs and the pretty pitcher just really sets the table nicely. Thanks for sharing with the newbie party. The lilacs in the pitcher are beautiful. I am now your newest follower via email. Michele, you chose the perfect vase for the colour of those lilacs. The strange weather has affected plants everywhere I think. I had very few tulips flowers. Oh my your lilacs are so so beautiful. I bet the scent is heavenly. 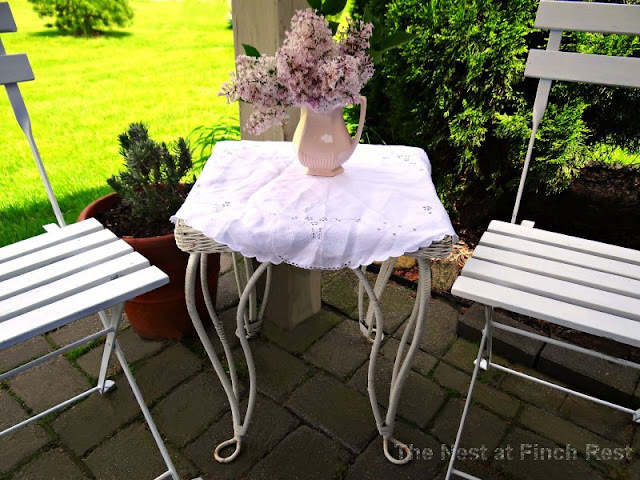 The pink vase is just perfect for them and your new table is a great find. i like it. very pretty Lilacs! I love your pink pitcher and the table. I love lilacs and I so wish I could have them here but it's too hot. I'm trying to remember the smell. I love your little wicker table and chairs. 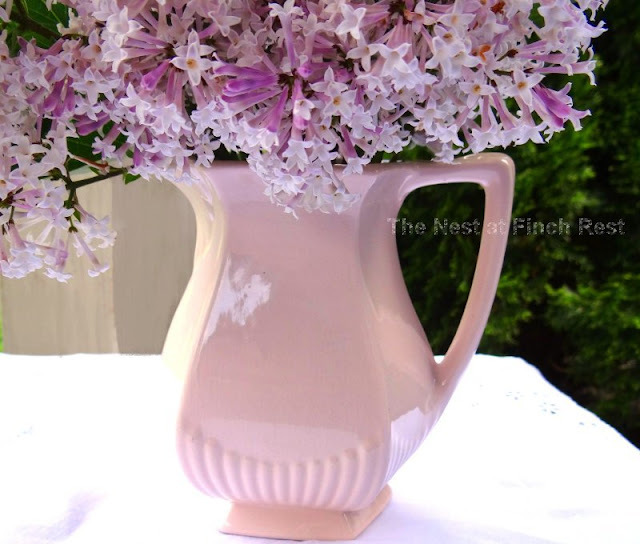 The pink pitcher and pretty lilacs are gorgeous! Everything looks so pretty. Also congrats, I see you are featured on Cozy Home Scenes this week. So gorgeous......I can almost smell them. COME VISIT ME!! 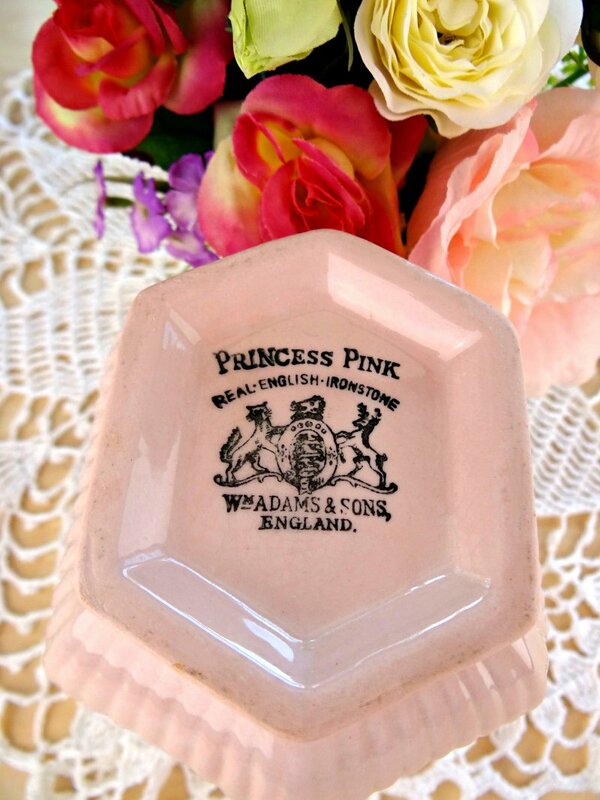 My Mom has some pink McCoy pieces, but I've never seen pink ironstone. Your pitchen is very pretty with the lilacs. You were lucky to have one bush that bloomed so well because these are gorgeous. I bet your friends are thrilled with their bouquets too. Thanks for sharing with us at Your Cozy Home Party and congrats again on your feature this week! That pink ironstone was quite a find. I've never seen any, until now, myself. It is going to come in very handy for many of your bouquets. That nasty return to winter after the warm weather messed with my lilacs, too.